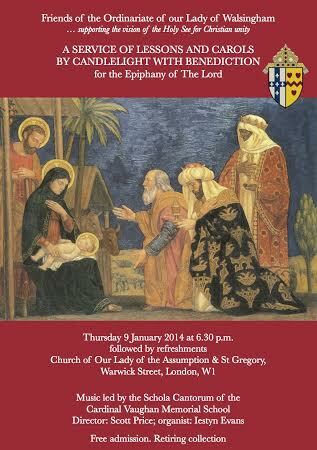 To coincide with the third anniversary of the setting up of the Personal Ordinariate of Our Lady of Walsingham, a service of lessons and carols for the Epiphany will be held on Thursday 9 January 2014 at 6.30pm at the Church of Our Lady of the Assumption and St Gregory, Warwick Street, London W1. The service, which will be led by the Ordinary, Monsignor Keith Newton, has been devised under the supervision of Monsignor Andrew Burnham, an Assistant to the Ordinary and an expert on music and liturgy. It will feature post-biblical readings, drawn from the riches of the British spiritual tradition, alongside lessons from the scriptures. The service will conclude with Benediction. Music will be provided by the well-known Schola Cantorum of the Cardinal Vaughan Memorial School and its organist, Iestyn Evans. Guest readers will include the Catholic journalist, Christopher Howse, Catholic Parliamentarian, Sir Edward Leigh MP, and Headmaster of the Cardinal Vaughan Memorial School, Paul Stubbings. The evening has been arranged by the Friends of the Ordinariate and there will be a retiring collection for its work. Refreshments will follow. All are welcome.